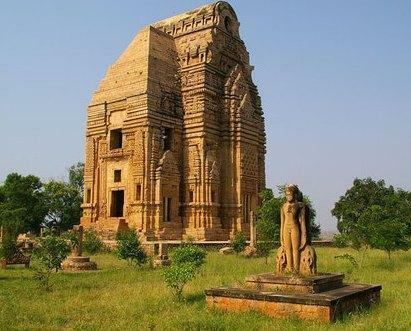 There are many places to visit in Madhya Pradesh. Gwalior Fort is one of the important world heritage sites with many monuments and structures. 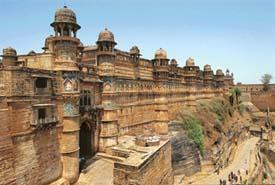 Here you can read about History of Gwalior fort, view Gwalior Fort images, travel information about this heritage site. Though, there are many places to visit in Madhya pradesh, this fort serves as the prime Historical Destinations in this place. Gwalior Fort is one of the main forts in Madhya Pradhesh. This fort was built in the 8th Century and has lots of history to narrate. It has a turbulent past which narrates the deep and interesting history of the past which involves a lot of bloodshed and courage. The fort is located roughly 2 miles from the city and can be easily accessed by auto-rickshaws or Private taxis. It is spread over an area of 3 square km on a rocky hill of Gopachal. If the legendary tales are to be believed, the layout of the fort was built by Prince Suraj Sen for a sage Gwalipa whose name was given to the fort and thus the fort was known as Gwalior. The city that came into existence later on surrounding the fort was named after the fort. The fort is longest towards the north-east side with 2.4 km. The walls of the fort are made from solid sandstone which made it completely strong and sturdy. The walls of the fort rise up to a height of 35 feet. One of the unconquerable and safest structures in India, this fort has been referred as the Gibraltar of India. It has always fascinated lots of artists and poets for its amazing layout and majestic beauty. Zahir ud-din Muhammed Babur, one of the Muslim Conquerors tabbed this fort as The Pearl In The Necklace of Forts of Hind. Due to its Majestic beauty and strategic location, This place has been a center of attraction for many rulers of the past. The Mughals, the Marathas and the British fought to take control over the fort. The layout of the fort was further built into a strongest and beautiful masterpiece by Raja Man Singh Tomar in the 15th Century. The Mughals fought for the fort and then the Marathas which was later on followed by Rani Laxmi Bai along with Tatya Tope. Finally it was the British who fought for the fort and then the Fort went back to Scindias. This fort has many historical monuments inside the fort. It is divided into two parts. One is the Main Fort and the other part includes the Man Mandir Palace and Gurjari Mahal. The main fort area is the main attraction. The main entrance is called as the Hathi Pul Gate and the other entrance is called the Badalgarh Gate. The fort rampart is laid along the hill's periphery and is connected by means of 6 towers. The complete fort wall gives a uniform look and gives out a unique appearance. The Gujari Mahal on the other hand serves presently as an Archaeological Museum. Gujari Mahal was built by Raja Maan Singh for his loving wife Mrignayani. The archaeological museum that the GUJARI Mahal is transformed into showcases various artefacts which are related to the ancient history right from the 1st Century BC to 2nd Century BC. There are various Hindu and Jain Sculptures and artefacts showcased in the Gujari Mahal Archaelogical Museum. Few of the known artefacts include the Miniature Statue of Salabhanjika and replicas of Frescoes seen in the Bagh Caves. The Man Mandir Palace is located towards the northeast end of the fort. The Man Mandir Palace was built by Man Singh Tomar and is often referred as a Painted Palace. The painted effect of the Man Mandir Palace is due to the use of styled tiles of Turquoise, green and yellow used extensively in a geometric pattern. Each of the inner courts of Man Mandir Palace is been ornamentally done with carved brackets and colorful tiles. The Light and Sound Show is held here in Man Mandir Palace at the fort. Apart from these structures few other structures which are present inside the fort include the Teli Ka Mandir or the Oilman's Temple, which was built during the 8th Century; Saas – Bahu Temple which was built in the 10th Century, Chattris of Maharaja and Gurudwara Data Bandi which was constructed in the memory of the sixth Sikh Guru Har Gobind. Additionally there are around 7 Hindu Temples and 4 Jain Temples inside the fort. The Fort is open for visitors all day long from 8: 00 am to 6:00 pm. But the structures and monuments inside the fort are open for visitors only from 9:00 am to 5:30 pm. Since there are many points to visit inside the fort considering how big and magnificent it is, one may need at least half of the day to pay a visit to the entire area. The Archaeological Museum at Gujari Mahal is open from Saturdays to Thursdays. The timings for the archaeological museum at Gujari Mahal are 10:00 am to 5:00 pm. 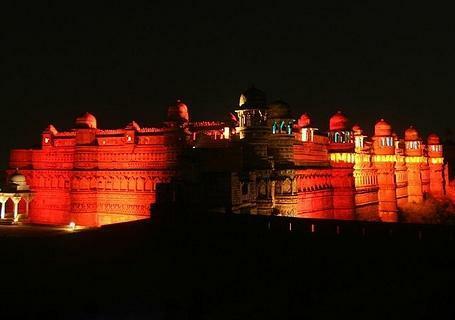 The Sound and Light Show is an additional attraction of Gwalior Fort. The Sound and Light Show forms an integral part of the visit to the Fort. The show is held at the open Amphitheatre at the Man Mandir Palace in the evenings and is a musical narration and storytelling about SAGE Gwalipa and the isolated fort during those times. The story narration is done by Superstar Amitabh Bachhan. The story also continues further and mentions about the severe turbulence the fort has faced during the historical times. The Sound and Light Show is definitely worth watching, for the knowledge of the true happenings of the history. A visit to the fort is incomplete if one plans to visit the fort and not watch the Sound and Light Show that is held here. Thus the fort comes alive every night to echo its glorious past and to illuminate every nook of the Man Mandir just to give you a glimpse of its historical past. I find is a shame that they charge Rs5 as entrance fee....it is a great insult to the historic monument that has so many wonders to display. In other countries, they will charge heavily to see such a place. ...£15-£20. We should charge at least Rs 250 for Indians and Rs 1000 for foreigns. It is still very cheap compared to other places. With the money collected, we could offer better facilities to the visitors, like clean toilets. Another suggestion is that we should have a souvenir shop attached to all our tourist spots and sell items specific to the monument like key chains, miniatures and fridge magnets. We can bring in so much revenue through our historic monuments. I fully agree with Ms. Padmaja Ashok ! We had to pay huge entry fees for monuments and attractions, even in China, leave alone Europe and the US. Padmaja madam, not all tourists at this palace are affluent who can afford to pay 250/- as entrance fee. Or u want it to be visited only by rich & not by the common man ??? Say about maintenance of toilets, it can be paid one and maintenance could be done with that. Citizens pay many taxes, so high pricing of tickets is not required for maintenance. It should be free rather and toilets should be paid one. I just loved the way in which everything is explained about the Gwalior Fort history and had a good feel of the places, things to be done is explained very well and helps to plan a good trip. Miss Padma in or democratic country people like you also exist who can speak whatever junk you feel like. Cleaning of toilets has nothing to do with charging heavy money. It is simply the will of the government/care takers.